Antiochus VIII was ruler of the Seleucid Empire between 125 BC and 96 BC, initially alongside his mother, Cleopatra Thea. 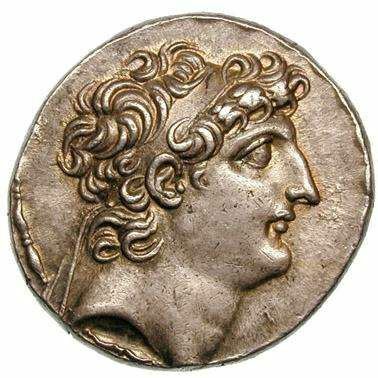 He was crowned as a teenager in 125 BC after his mother Cleopatra Thea had killed his elder brother Seleucus V. After Antiochus defeated Alexander Zabinas in 123 BC, his mother tried to poison him with wine, but the suspicious king forced her to drink the cup herself. Despite political shortcomings, Grypus was a popular king. In 116 BC, his half-brother and cousin Antiochus IX Cyzicenus returned from exile and a civil war began. After murdering each other's wives, the two brothers then divided Syria between them until Grypus was killed by his minister Heracleon in 96 BC.